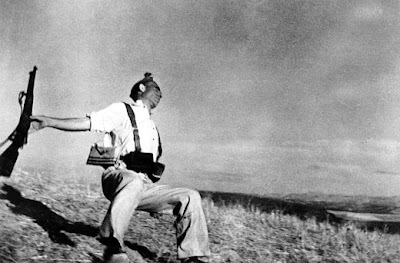 It's the iconic photo that captures the essence of the Spanish Civil War: a soldier falling to his death, arms splayed out behind him, gun still in hand, after being shot on a grassy hill. But new evidence now claims to prove once and for all that the camera does lie - and Robert Capa's famous Falling Soldier was faked. Capa was a man of the left, and "Falling Soldier" helped to alarm the world about fascism rampant. But noble purposes do not validate misrepresentations. Richard Whelan, Capa's biographer, calls it "trivializing" to insist on knowing whether this photo actually shows a soldier mortally wounded. Whelan says that "the picture's greatness actually lies in its symbolic implications, not in its literal accuracy." Rubbish. The picture's greatness evaporates if its veracity is fictitious. To argue otherwise is to endorse high-minded duplicity -- and to trivialize Capa, who saw a surfeit of 20th-century war and neither flinched from its horrors nor retreated into an "I am a camera" detachment. As a warning about well-meaning falsifications of history, "Falling Soldier" matters because Capa probably fabricated reality to serve what he called "concerned photography." I'm still debating what side to take on the whole issue... it does seem to deflate the whole image a bit... any thoughts on the subject? Leave me some comments. And speaking of comments, like almost everything in the nation these days, this photographic issue has become a barbarous debate between the vast right wing conspiracy and the equally vast kooky left wing nuttery. Read the WaPo's comments to Will's point of view here and have fun with the kooks from the extreme right and the nuts from the extreme left. If you read this blog then you know that I've been always very impressed with the BlackRock Center for the Arts gallery's 1500 square feet of exquisite gallery space. With its high white walls and beautiful windows strategically placed, this gorgeous gallery allows in just the right amount of natural light. BlackRock Center for the Arts is located at 12901 Town Commons Drive Germantown, MD in upper Montgomery County, about 20 minutes from the Capital Beltway (495). They currently have a call to artists and the call is open to all artists residing in Maryland, Virginia, and Washington, DC over the age of 18. Original artwork only. All work must be ready for sale and to be presented in a professional manner to the public at the time of delivery. This call will cover exhibits in the gallery from September 2010 through August 2011. An exhibit may include one applicant or a combination of applicants, based on the judgment of jurors (i.e., 1 or 2 wall artists may be combined with a pedestal artist). A jury will select the artists and create eight exhibits to be included in the exhibit year. The jury panel is comprised of my good friend and gallerist Elyse Harrison, Jodi Walsh, and yours truly. How to apply: All correspondence will be done by e-mail, so contact Kimberly Onley, the Gallery Coordinator at konley@blackrockcenter.org and ask her to email you a prospectus. Don't wait to the last minute! Get the prospectus now! 6x16 in. framed to 14x22. Charcoal and Conte on Paper. 2009. Asere is a Cuban street slang word that means something akin to dude, or friend, or buddy, or "bro"... you get the drift. In this drawing, the wall graffiti asks "Asere, Yes or No?" while the question itself answers by the capitalization... and Che laughs.